Just after the Occupy Wall Street encampment in Zuccotti Park was evicted in 2011, a number of organizers were coming together to assess what might come next in building a broad-based alignment of movements that could reshape our country. We had all kinds of assessments of what was missing in the infrastructure of Left movements, the ways activists can become afraid of their own power, and why Occupy was unable to maintain its momentum. We also felt ready to support the inspirational grassroots work that had emerged around the country, particularly around the foreclosure crisis, Hurricane Sandy, and then Stand Your Ground laws and the murder of Trayvon Martin. Many of us were movement facilitators and educators, and decided to put our energy into building a new kind of capacity-building group: one that did not just “train” individual activists, but supported whole-organizations to step into their vision, power, and strategy. We called it The Wildfire Project, because we wanted these frameworks to spread. We initially lit a spark by supporting grassroots organizations like Rockaway Wildfire, who were doing peoples’ hurricane relief; and housing justice organizations like Occupy Homes Minnesota & Atlanta who using direct action to keep people in their houses in the midst of bank seizures. They were all in crisis-mode, much like most of our movements are now, under the Trump administration. These first workshops helped those groups deepen their analysis of the systems that were driving these crises, get grounded in their collective stakes, and envision the world they were fighting for beyond disaster recovery, winning back homes, and stopping evictions. Woven through all of that was a focus on transforming self-limiting beliefs and barriers. We supported the groups to confront the fears and anxieties holding them back, and to fight for new, more powerful visions of themselves and their work. This piece of our methodology–transforming self-limiting beliefs and barriers–is the thing that has deepened the most over the course of Wildfire’s life. Since we both facilitate and participate in social movement groups, we’ve collected a lot of experience over the last six years about what holds them back. We spent the last few years refining those experiences into assessments of movement culture. 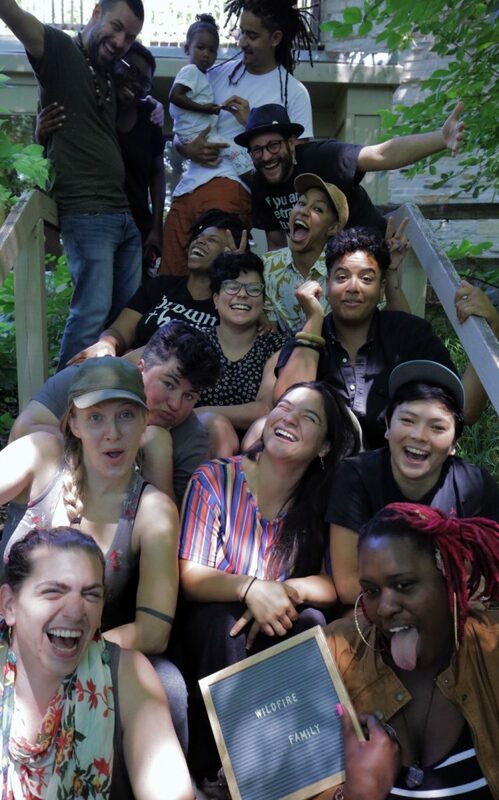 Now, the Wildfire Project helps shift the culture of Left activism towards healthy, resilient, strategic group culture by intervening on some of the ways our movements can become reductive, self-marginalizing, and burnout-oriented. We’ve had the gift of working with remarkable organizations, facing the most daunting of challenges, and have noticed consistent patterns in the ways we hold ourselves back without even realizing it. One example is aversion to conflict – there are often topics that members of a group feel like they can’t talk about because they’ll get hurt or the group will fall apart. This usually isn’t a conscious choice; its an invisible pattern of avoidance that the group tacitly agrees to maintain. Those silences often keep the group from accessing its own wisdom, and the resources it embodies. At Wildfire we now believe that conflict and tension are the engines of growth. It always comes back to agency. One of the things that is special about Wildfire is that we’ve taken this assessment that there is a culture in the movement that limits us, and we’ve combined the task of transforming that culture with the work of confronting self-limited beliefs and recovering our agency. By recovering our agency, we mean finding our power to make choices that previously felt impossible. When groups in a Wildfire workshop successfully make one choice that felt impossible – such as engaging in a taboo conflict – they feel their ability to make choices like that in other areas of their work and their life. This increases the range of options and possibilities on the table and makes us much more powerful.